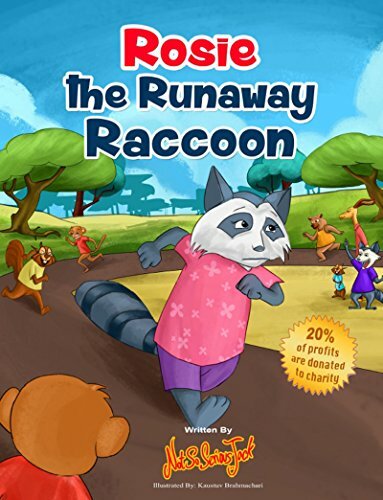 Rosie the Raccoon believes that she has a talent for running. She decides that she wants to run against the other animals in the town race. Rosie is eager to win her parents’ approval and asks her mom to make her something special to wear. But Rosie’s mom gets busy at work and forgets her promise. To make matters worse, neither of Rosie’s parents take off time from work to attend her race. Rosie is proud to finish third, but her achievement is overshadowed by the disappointment she feels in what she perceives to be her parents’ lack of interest. Rosie decides to make plans to run away. She decides that Rome would be the perfect spot. When Rosie overhears her parents talking about the race, she is shocked to learn their true feelings leading to an unexpected turn of events. This picture book written in rhyme is intended for early elementary school-age children. The story is cute, even if the rhymes are sometimes forced and uneven. Recommended as a bedtime or read aloud story for children ages four through eight. I struggle when the rhyme isn’t quite right, but this does sound like a cute book! Thanks for sharing at Booknificent Thursday on Mommynificent.com! So many authors feel that rhyme is needed for a children’s book. This one has much to offer in the way of content. I think that it might have been just as effective if written in prose.